Our Petite Roche gite apartment is surrounded by some great views of the mountains and sunflower fields around us and has independent access and private parking. 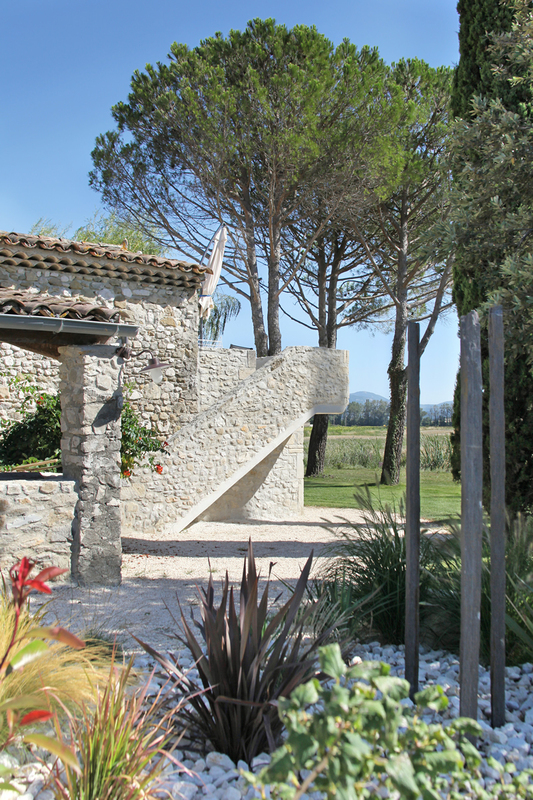 The stone steps from the mineral garden lead to the peaceful terrace with dining furniture, shade and a BBQ. The French windows lead into the airy sitting /dining room. The gite is imaginatively decorated with interesting artefacts, original art pieces and rugs haggled for in the Marrakesh souk. The furnishings are comfortable and the lime washed walls reflect the ochre and terracotta pigments of old Provence. Plenty of glasses , plates , utensils , bowls and good selection of herbs, spices , olive oil, balsamic,-all the basics. Off the small hallway is the WALK IN SHOWER / WET ROOM / WC/. Super king size quality comfortable bed (2 singles are available if required). 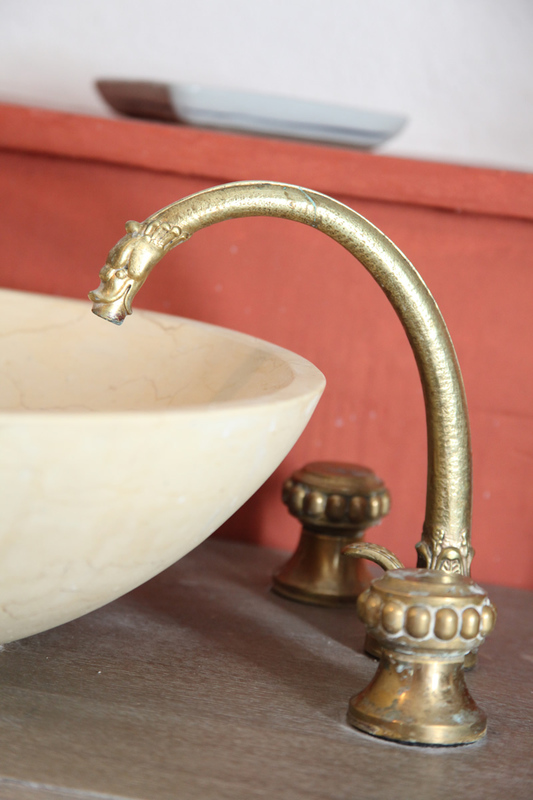 The pretty marble sink unit, antique taps, kelim rugs, and mirror collection complete the’ exotic’ atmosphere. 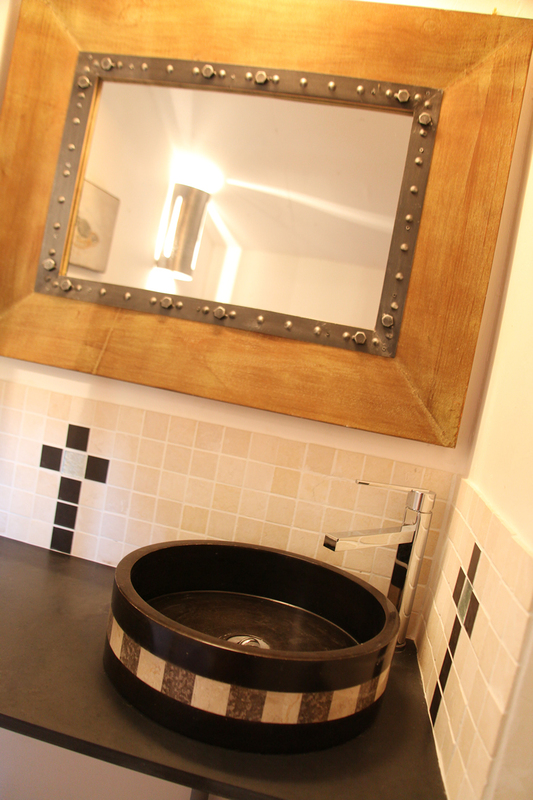 The gite is thoroughly cleaned before your arrival, with all bathrooms, kitchen and pool towels provided. In summer the sitting room is air conditioned and there is central heating throughout. We leave you a decent bottle of wine and a welcome basket with ingredients for a simple meal and breakfast. Comfortable beds (all made up for you). We are very happy to provide a shopping service, and if you let us know of your requirements before your arrival, we will make sure they are bought and any perishable goods put away in the fridge or freezer. We had stayed with Bob & Celia several years ago at their previous property and enjoyed both their company and the quality of their accommodation so were looking forward to their new venture at La Petite Roche. We are not disappointed! The apt had only recently been completed and was superb, with modern kitchen fully equipped and supplied with all the small things you need when self catering but don't want to buy such as pepper&salt, spices, olive oil, sauces, jam and fruit juice to name a few! The apt had a nice living room with table and chairs and comes with UK TV. Both bedrooms are large doubles and the whole place has a nice traditional but modern feel to it. 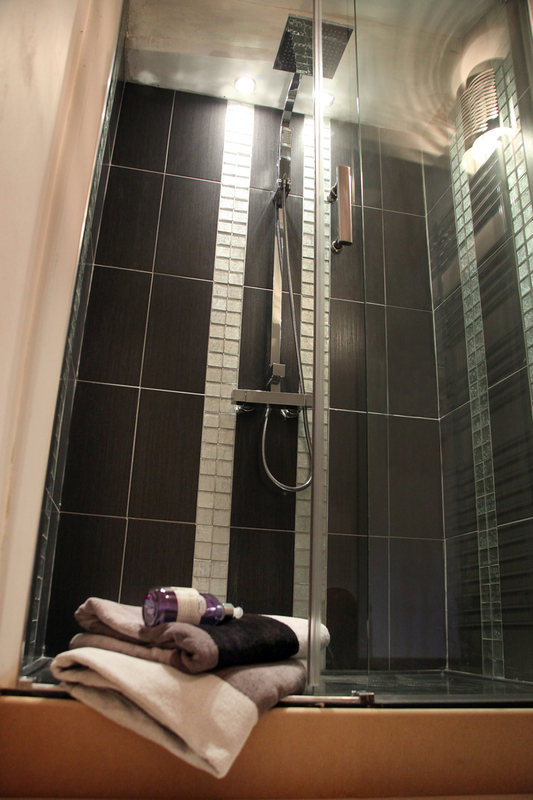 Both bathrooms are fitted with good showers and well finished. A really magnificent heated pool finishes the job! The apt has separate access (outside stairs) and small balcony large enough to eat on or take in the sun! We will certainly be returning before long.